If all vegan food was prepared this well I could give up meat. I’m on the second floor of S&P Oyster enjoying a spectacular 180..
Fearless Flyers Academy is a facility dedicated to bringing the joys and health benefits of Circus Arts to everyone. 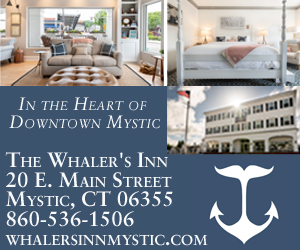 They’re celebrating Black Friday ALL MONTH..
Santa, Tree Lighting, Holiday Lighted Boat Parade & Shop Small Nov. 24th Mystic opens the holiday season with a visit from Santa on a tugboat,.. Mystic Pirate Invasion October 12, 13, 14: Gear up for a fun-filled weekend full of pirates, plunder, kids crafts, balloon creations, pub crawling, scavenger hunting,.. Crisp days are better with soup. Or, better yet, ramen with freshly-made noodles. Downtown Mystic has just the place: Samurai Noodle Bar and Grill. Forget.. Both of the lobster’s large claws are securely banded prior to showing friends. “It’s a female identified by a wide tale and wide swimmerets” I..
Five years ago, Sofia Sees Hope co-founder Laura Manfre had just founded a nonprofit, and needed a way to raise awareness. Manfre launched Sofia Sees..
B.F. Clyde’s Cider Mill Open for 2018! We can smell the donuts from here! Make some time to visit the oldest steam powered cider mill in the US and indulge in your..
5th Annual Mystic Eats September 7, 8, 9: Mystic Eats Riverside Food + Music Festival is a must-go downtown event! Try food from some of.. Mystic Museum of Art maintains a public parking lot at their address, 9 Water Street. Proceeds from parking go to the MMoA which offers FREE admission.. The 61st Annual Mystic Outdoor Art Festival Jury and the Greater Mystic Chamber of Commerce are pleased to announce the winning artists from this year’s.. Mystic Outdoor Art Festival 2018 August 11th and 12th: The oldest festival of its kind in the Northeast, the Mystic Outdoor Art Festival attracts close..
Meg (a maternal-child visiting nurse) and Juan (a graphic designer and burgeoning photographer) currently live in Brooklyn, NY with their dog Toby. Being in the..
A quick guide of where to stay, what to eat, and how to adventure in the lovely seaside village of Mystic, CT by a couple..
Mr. Maru and his crew know their way around Mystic! Here are some of their favorite dog friendly things to do: Downtown Mystic Furry friends.. Mystic River Day July 8th The 1st Annual Mystic River Day is on Sunday, July 8th. The day kicks off with the Sharkfest Swim down the Mystic..
First ever Adult Summer Reading Program at Mystic & Noank Library! All patrons age 18 and up are welcome to participate. Begins Monday, July 2nd and continues..
Shelby Farrell @fresh_world_press Seeking a fun workout routine while on vacation, looking for a way to elevate your ordinary workout, or in need of some..